Moving People, Changing Places is based on research conducted within the Diasporas, Migration and Identities Programme, www.diasporas.ac.uk. The pages in this section provide information on further reading, teacher resources and links for you to follow up. If you want to know more about any of the topics in Migration Histories, Locations, and Identities and Cultures, you will find links and references set out page by page in Further Reading and Credits. 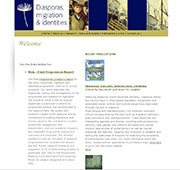 General resources on migration, identities, citizenship and minorities are also provided.